Our sailing gloves are quality full finger gloves that provide extra warmth in the water and offer protection, comfort and perfect grip for use in a range of water sports, including sailing and warm water diving. 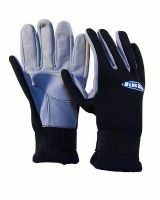 Our Blue Rush sailing gloves are manufactured to a high standard. They are made from 2mm neoprene and are double lined. The palm and finger tips are made of chamoise for perfect grip when wet. There is a velcro strap at the wrist.